Biology research associate Dr Emmanuelle Martinez and doctoral student Sarah Dwyer at Massey Albany preparing to carry out a post-mortem of a young orca found north of Auckland. An endangered young orca that was separated from its pod may have been unable to feed says a Massey University marine biologist carrying out a post-mortem of the mammal, which stranded at Whangaparaoa Peninsular this week. The 2.4 metre female orca was found by a member of the public on Thursday evening at Duck Creek, at the southern end of the peninsular north of Auckland and reported to the Department of Conservation. It was taken to the University’s Marine Pathology Unit at Albany on Friday and was to undergo a post-mortem examination on Saturday. Marine biologist Dr Karen Stockin, of the Institute of Natural Sciences, says the juvenile orca is likely to be the same one that has been sighted by members of the public during the past week around the Hauraki Gulf between Okahu Bay in the inner harbour and Browns Bay and Whangaparaoa peninsular further north. Scientists from the Orca Research Trust had also been searching for the orca, but trust founder and principal scientist Dr Ingrid Visser is currently overseas and unable to take part. Instead the post-mortem was due to be carried out by Dr Stockin and her research assistants and students. Dr Stockin says orcas sometimes strand but are usually more resilient at being re-floated and surviving, making the chance to carry out a post-mortem on the species rare. “Adult male orca can grow to up to nine metres in length and weigh several tonnes, making post-mortems often impractical,” she says. The procedure will reveal if the animal suffered any injuries or swallowed objects, such as plastic, that may have contributed to its death. But she suspects it appears emaciated because it was alone and unable to fend for itself. 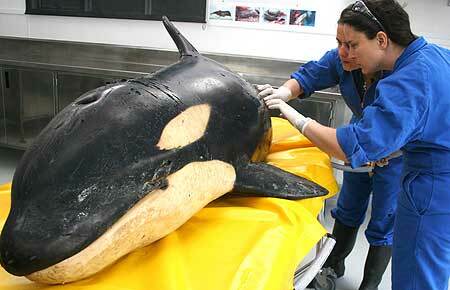 The orca found stranded is between two and three years old and was in poor condition. Orcas are social mammals, which forage and feed in pods. Although not endemic to New Zealand, they are considered endangered in New Zealand waters, with a population of around 250.